Six months ago, city officials gathered with gold-colored shovels to break ground for the Broadmoor Boulevard extension project. On Thursday, they celebrated its completion with a red-ribbon cutting. 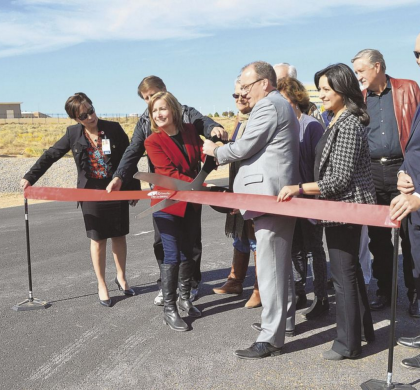 Mayor Gregg Hull and UNM West CEO Wynn Goering spoke at the event, as the newly paved road officially opened. “It’s always a good day when we can celebrate the end of a much-needed project,” Hull said. The project provided a two-lane paved road between Linderhoff Avenue and Paseo del Volcan, as well as a crack-seal and overlay for the existing road between Northern Boulevard and Linderhoff. New traffic signals were installed at Idalia Road and Broadmoor, and at Paseo del Volcan and Broadmoor. Franklin’s Earthmoving Inc. was the general contractor, having been awarded a $2.68 million contract in April. The city hired Wilson & Company for construction oversight for $316,460, and paid $254,343 to relocate public utilities. In total, the project cost is $3.25 million. The project was funded through a grant from the state Department of Transportation, city impact fees and the city’s higher education facilities gross receipts tax. It was originally scheduled to be finished in December. Hull said the road’s ability to connect more residents to City Center pushed project to the forefront of his priorities when he was elected two years ago. “Very rarely does extending one roadway accomplish so many things and that’s what makes this project so special,” he said. New Mexico Service Dog Teams endorses Gregg Hull for Mayor.